As a Rhode Island girl I am fortunate to have really awesome memories of going to the ocean on a regular basis and also enjoying the taste of a seaside summer right at my own kitchen table. We are fortunate here to buy them right off a fishing boat but if you can’t ( and most people can’t ) purchase live lobsters from a lobster co-op or lobster company, where lobsters are stored in submerged crates, pounds, or pools, or in large tanks filled with circulating seawater. Fish and seafood markets, particularly busy ones that turn over inventory quickly, are another good source. If buying from a supermarket, make sure the tank is clean and uncrowded, and that the lobsters are lively. A healthy lobster should flip its tail and kick its legs vigorously when lifted up. Live lobsters can be mail-ordered if they’re not available where you live. When I was little my dad and uncles would buy the lobsters off the lobster boat in Galilee and my mom would cook them whole. Back then she would steam or boil lobsters but later and in more recent years she learned and taught us how to to grill them. Can you believe this is the very first picture I ever posted on Instagram five years ago? I wanted to share other ways to enjoy the succulent pink and white meat that comes out of the most gorgeous bright red shell. 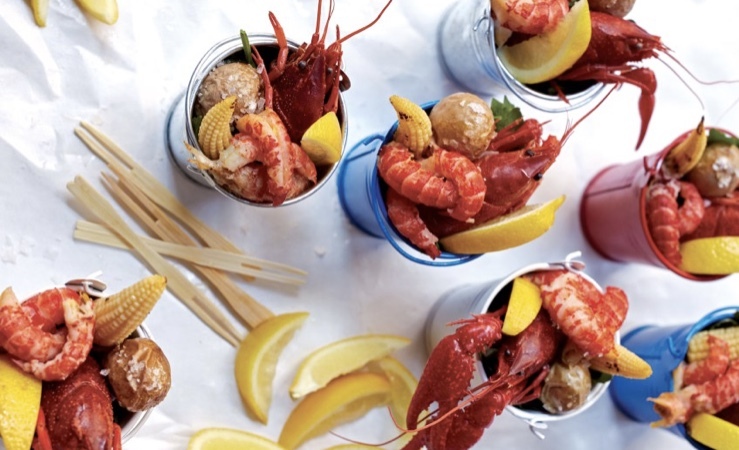 It’s easy to please guests by entertaining with lobster hors d’oeuvres and fancy lobster pies and super simple to enjoy lobster everyday in a quesadilla, salad or club sandwich. The best hors d’oeuvres can be really easy to do with a little advance planning. These Lobster and Avocado Bites will be worth every effort. Trust me. I absolutely love these Mini Brioche Lobster Rolls, which are a delightful play on the traditional lobster roll, and substantial enough so one per person is plenty, especially if you are planning other appetizers. Another appetizer? Of course. You definitely need to try these Haute Hors D’oeuvres: Mini Lobster Bakes. They are definite party worthy food and will most definitely be appreciated and instagrammed. And then there are fabulous Lobster Roll Sliders which are actually perfect for any time of year and especially great if you are entertaining around a game or sporting event. I’m obsessed with these awesome Lobster Roll Bites which involve one of my favorite snacks- Pretzel Crisps! Check out the recipe and see how easy and delicious it is. You will not want to just entertain with them. They will quickly turn into an everyday treat! Speaking of everyday eating, there are lots of ways to incorporate this flavorful jewel of a treat into simple recipes you will want to make on a regular basis. Try this magnificent creation from none other than one of my all-time favorite chefs, Bobby Flay. It’s called Lobster Club With Saffron Mayonnaise, Crispy Serrano Ham and Watercress on Chipotle Brioche. Doesn’t that sound amazing? And when you click the link for the recipe you even get to see Mr. Flay’s adorable little face. 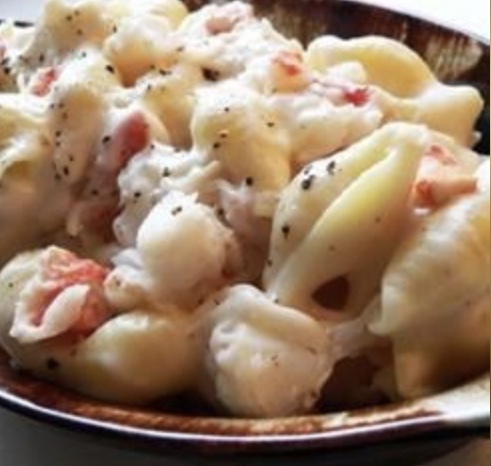 I love the combination of flavors in this Lobster Macaroni and Cheese recipe. It’s a kind of fancy yet homey dish that kids and grownups love. You can’t go wrong and also can’t find an easier way to please everyone than with this simple yet flavorful meal. This is a really amazing, luscious and easy to prepare Lobster Salad. I love the spicy onions mixed with crunchy celery in a creamy base in this recipe. It’s a quick meal that is perfect at home or to pack for a picnic. This salad which is called Block Island Lobster Salad With Citrus Vinaigrette is full of great flavor and you can play around with different herbs such as parley and mint in place of suggested tarragon. I love the mix of citrus with chives, avocados and bibb lettuce. This vibrant dress is as versatile as the star (Lobster, of course) of tonight’s blog post and I found it on Amazon back at the beginning of 2018 for a ridiculously low price. I wore it with black OTK boots and an ivory faux fur jacket during the coldest months of the year and later with burgundy tights and rose gold shoes as the weather in New England warmed up in April and May. I have a list of lots of practical, fun, and affordable items from Amazon linked here for your convenience. My leggings from Leg Appeal have been a favorite go-to pair for about a year now and I first blogged about them here. These awesome sandal/boots are from Andrew Stevens New York and you’ve seen them before here. My necklace is from the Pearls of Wisdom collection which is all created and designed by Sue Fontana of Aries Artistic Jewelry. Of course my hair was styled by the one and only Jannine Hansen of Supercuts in Johnston, RI ! I wore this outfit to a really fun “Mom’s Night Out” with these lovely and amazing friends. If you are ever in Rhode Island and want to have a really delicious meal you definitely want to try the lobster ravioli or basically anything on the menu at Constantino’s Venda Bar in the heart of Federal Hill, Providence! When I was there it got me thinking of lobster and good food in general and I thought maybe I would share not just my outfit for this blog post but also some really great recipes that might inspire you to try something new or revisit an old favorite food and try it in a different way. Thank you so much for visiting my blog today. It means so much to me to have your time and attention and I really hope you found this post worthwhile. I would love to hear from you so feel free to leave me an email, comment or even a link in you have something to share. I will most definitely get back to you in a timely fashion. And my daughter, Angelina, with her first ‘lobster’ bib. I believe we were at Aunt Carrie’s Restaurant and she was about six months old. PS. I do have a new project on DonorsChoose that I would really appreciate any small amount of help with. It would be awesome if my students could express themselves artistically to celebrate their diversity. All details are here and honestly every little bit helps and is greatly appreciated.